The Compressor is one of eight Vienna Suite effects. VSL is best known for its orchestral sample libraries, but the company is now to enter the plug-in effects market with the launch of Vienna Suite. 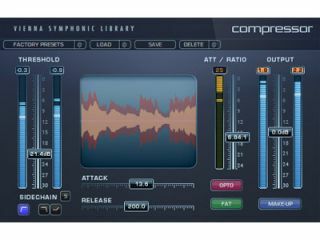 Designed for mixing and mastering and described as "advanced, yet easy to use", the Suite offers 64-bit processing and currently contains eight effects. These are: Equalizer, Master Equalizer, Limiter, Compressor, Multiband Limiter, PowerPan, Exciter and Analyzer. The Vienna Suite can be used on Mac or PC by anyone who has a VST, AU or RTAS host, but owners of VSL's virtual instruments should note that it contains a number of special presets that are designed specifically to work with these sounds. Priced at €395, the Vienna Suite will be available soon, as will a demo version. You'll need a Syncrosoft Key if you want to run it.